X-Ray Number 2 Published Spring 1994 - limited to an edition of 200 copies. 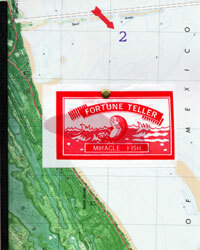 Surveillance maps on front cover along with fortune teller fish. This edition limited to 200 numbered copies. The theme for this issue was Chance (the only theme issue). Includes Bukowski and Interviews with John Cage and FLUXUS artist Jackson MacLow plus Jaime Crespo, Frank Kohler. Fun Facts: No. 2 was the first and only issue to have a theme. The Theme was CHANCE.